Our Feather Bed Topper is 90% soft feathers and 10% down. Our down and feathers are specially processed soft duck. Our Feather Mattress Toppers are wonderful! They have an incredible b inch loft depth when fluffed! The box baffles are spaced between 12 inches and 15 inches square, depending upon the size of the feather mattress topper that we are sewing. The feather baffles help provide luxurious comfort and keep the feathers and down where they need to stay. The outer fabric is a fine, soft feather proof 230 thread count cotton twill weave. Our feather beds are hypoallergenic, anti-bacterial and yes, even washable. Please select the length you will need by checking the box. 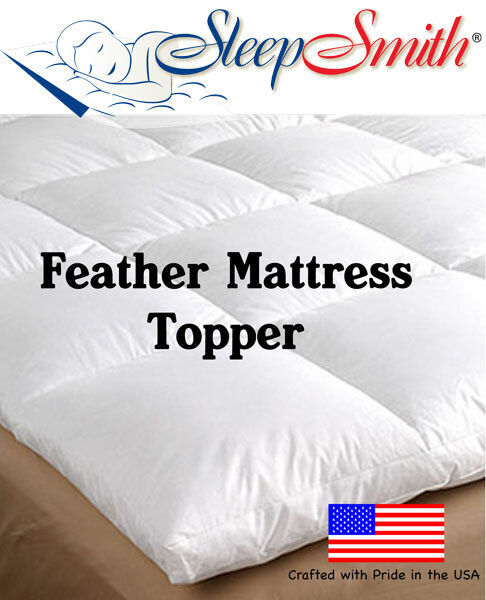 48 Inch Size Feather Bed Topper for three quarter size mattresses. Hypoallergenic and anti-bacterial.